How to Change Search Engine on iPhone – iMobie Inc.
Read this guide to know how to change search engine on iPhone: from Google to Bing, Yahoo or DuckDuckGo in iOS Safari. Download AnyTrans to better manage content on your iPhone iPad after reading this guide on how to change search engine on iPhone. The default search engine of Safari on iPhone is Google. There is no need to change the search engine if you are into Google Search, or you may want to change a different one on your iPhone. With iOS 8, you can choose to switch your browser's default search engine from Google to something else like Bing, Yahoo and DuckDuckGo. - Google: The default search engine. It returns results from Google in your local territory. - Bing: Microsoft's alternative to Google Search. - Yahoo: It is built by Yahoo. The results will be similar to Bing for Yahoo is powered by Bing. 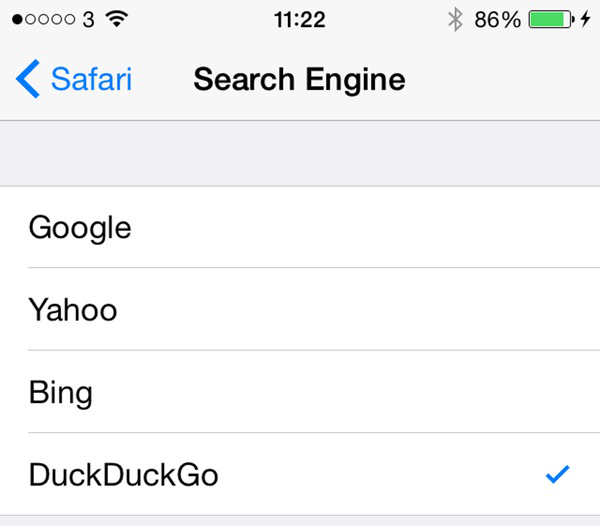 - DuckDuckGo: A new option that is available in iOS 8. It proclaims itself to be the "search engine that focuses on smarter answers, less clutter, and real privacy." Step 1. Go to the home screen of your iPhone, tap on the Settings app. Step 2. Tap on Safari. Step 3. Tap on Search Engine. Step 4. Select a new Search Engine like Bing, Yahoo or DuckDuckGo. You can still use other search engine even if you set one as default for the search field. Just enter the URL (google.com, yahoo.com, bing.com, etc.) in Safari and you can use any one to get the results as you want. If you want to manage the iPhone data like safari history, bookmarks, photos, videos, music, you can download AnyTrans to have a try. Any questions on this post will be warmly welcomed, and don't forget to share this guide with your friends.